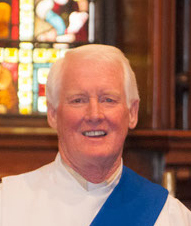 The Reverend Thomas L. Runge serves as deacon at St. Paul’s Episcopal Church. After a four year service in the U.S. Air Force, Tom attended aeronautical training at Piedmont Aerospace College in Winston-Salem, N.C. This led to a thirty-two year aviation career with Procter & Gamble. In 1980 Tom began his ministerial studies for the Diaconate at St. Pius Tenth Seminary in Erlanger, KY, followed by Pastoral Ministry training at the College of Mt. St. Joseph. He was ordained in the Roman Catholic Church in 1985. In 1999 Tom married Sheila Dodd and they joined the Episcopal Church. They spent 10 years at Trinity Church, Covington, KY.
Sheila and Tom are Northern Kentucky natives, now living in Cold Spring. They spend a lot of time with their big family, including nine grand-children. They love to travel and vacation in warm climates. Tom makes frequent trips to Guatemala working with the Diocese of Lexington companion diocese program and Living Waters World Missions.